Eyes are the most important and sensitive sense organ, and to keep eyes healthy and fit should be the most important thing in our daily lives. Eyes need the same amount of care and protection as other parts of the body. In the age of computers, where we have sedentary lifestyle and our work requires us to sit in front of the screen for long hours, we tend to neglect our eyes. Before the damage caused to our eyes become irreparable, take some precautions. This article will help you to know how to keep your eyes healthy. These food items can help you improve your eyes and in maintaining good eyesight forever. What to eat to improve eye health. Why sunglasses are important to wear? 20 minutes rule – Look away from computer screen. Eye protection starts with what you serve yourself because whatever you gulp in, will bring results on your face, skin, eyes, and every other part of the body. So, always eat healthy to stay healthy. Nutrients such as Omega-3 fatty acids, Vitamin C and E might help cure age related vision problem. Regular consumption of food. enriched with these nutrients can help you achieve good eyesight. Diet rich in such foods can be associated with lower levels of eye disease than other types of diets. Omega-3 is know to have a lot of advantages for your body. For non-vegetarians, Omega-3 fatty acid rich fish – Salmon, sardines and mackerel is recommended twice a week to make your eyes stay healthy. The omega-3 fatty acid also protects heart along with eyes. For vegetarians, the best source of omega-3 is Flax seeds and you also get good amount of omega-3 if you eat broccoli and Brussels sprouts. Note: Please avoid farmed fish and check the sourcing of fish to minimize the presence of lead and mercury. Pulses like lentils and kidney beans are excellent sources of zinc. Apart from good eating, sunglasses are important to wear because too much UV exposure is likely to get cataracts and macular degeneration. The right kind of sunglasses will help protect your eyes from the sun’s ultraviolet (UV) rays. If you wear contact lenses, then also it’s a good idea to wear sunglasses for more protection. 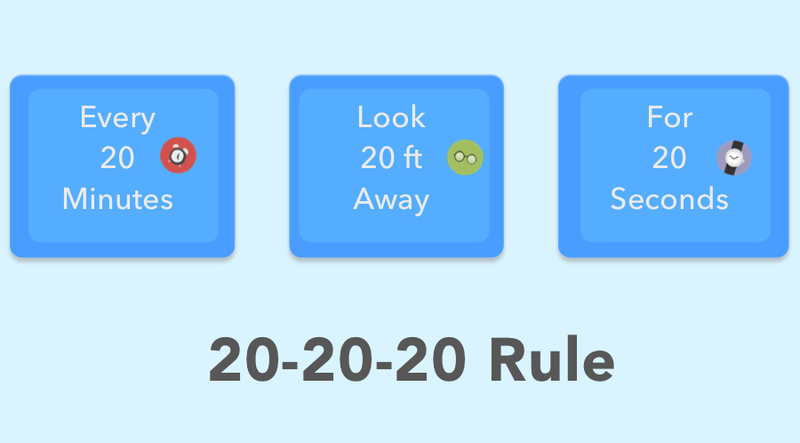 20-20-20 rule, it’s a very simple and effective rule for those who are always on computer. Ergonomics are very important while we are on work. Our posture is an important factor to keep ourselves fit, especially if you have sedentary work most of the times. 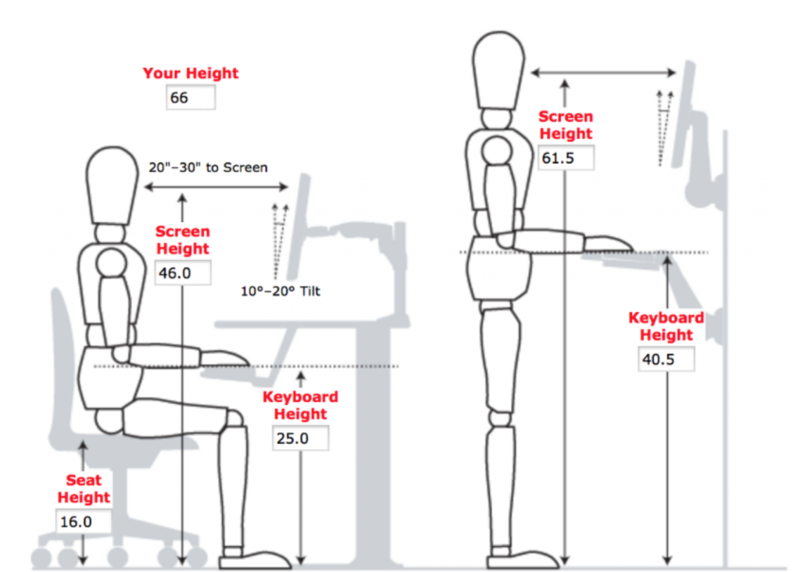 For more information on ergonomics,you can follow this resource generated by HP. You can also use this workplace planner if you’re looking for some exact measurements. Check the below screenshot. Don’t go out in direct sunlight, if it is urgent use sunglasses. Minimize or discontinue cigarette smoking; it is not only injurious to health but also badly affects your eye sight. Fatty and fried food should be avoided. They all irritate tissues in the eye and cause it to deteriorate easily. P.S Adopt a healthy lifestyle and love yourself.